It was to be my last fishing day for a while. 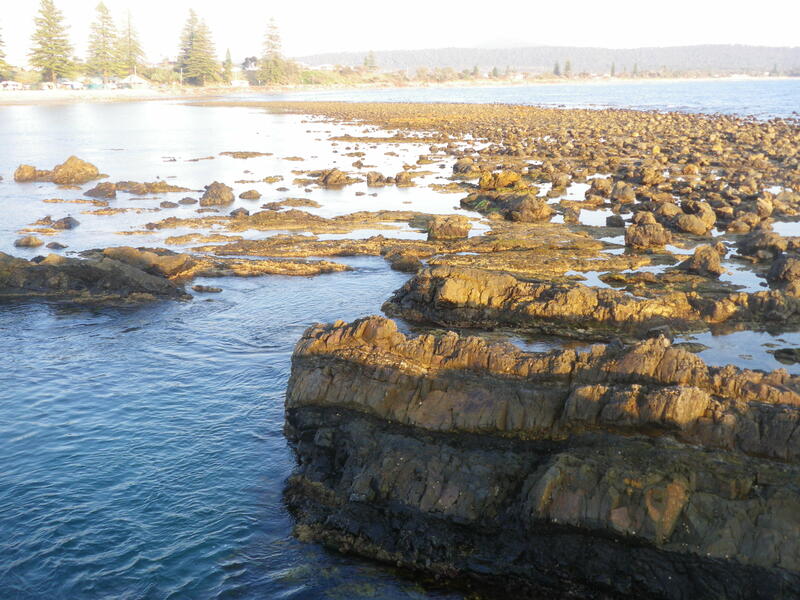 I decided to try fishing the rocks at the front of Plover Island, at the mouth of the Sandon River, about 10kms south of Brooms Head in Northern New South Wales. At low tide you can walk across to the sand spit to the Island. 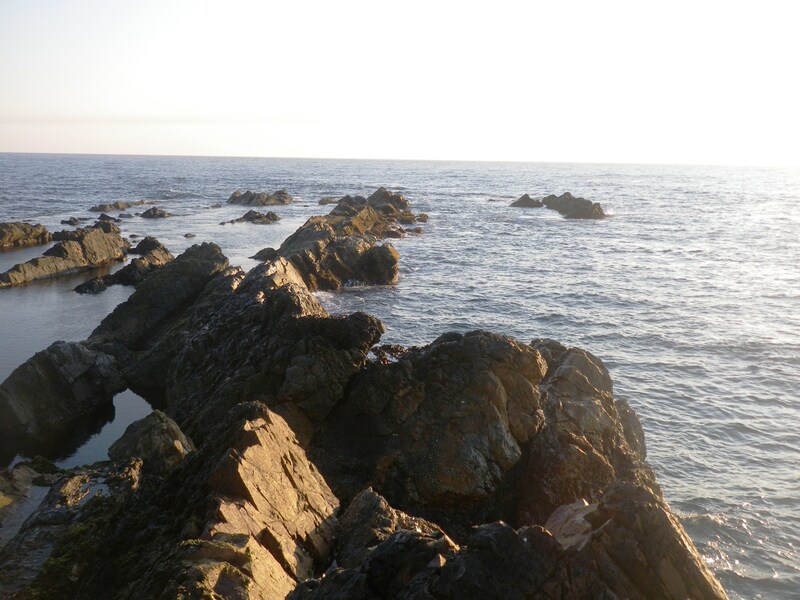 The northern side has a number of rocky platforms to fish from. I arrived at about 9.30 am, just before low tide and climbed across a rocky causeway to some really fishy looking water on the northern side. I started with a GULP 2” Shrimp in the Pepper Prawn colour on a 1/8th 1 jighead. I got a couple of hits on the first cast and on the second, I caught a small Butter Bream. I caught a few more of these and then pulled up a 25cm Tarwhine. I fish this spot again at either dawn or dusk. I moved around to another rocky outcrop and caught a few good sized Pike. I made a mental note to come back and fish this spot again at either dawn or dusk, one day. For the afternoon session I was back at the Brooms Head lagoon. It would be high tide at about 5.00 pm and decided to clamber along the rock ridge at the eastern end of the Brooms Head lagoon. I rigged up with the favorite soft plastic of the week –the GULP 3” Pearl Watermelon Minnow. It was fairly choppy – with a strong south easterly blowing. Was using a 1/8thoz, 1/0 jighead, my light 7’6” spinning rod and a 16lb fluorocarbon leader. 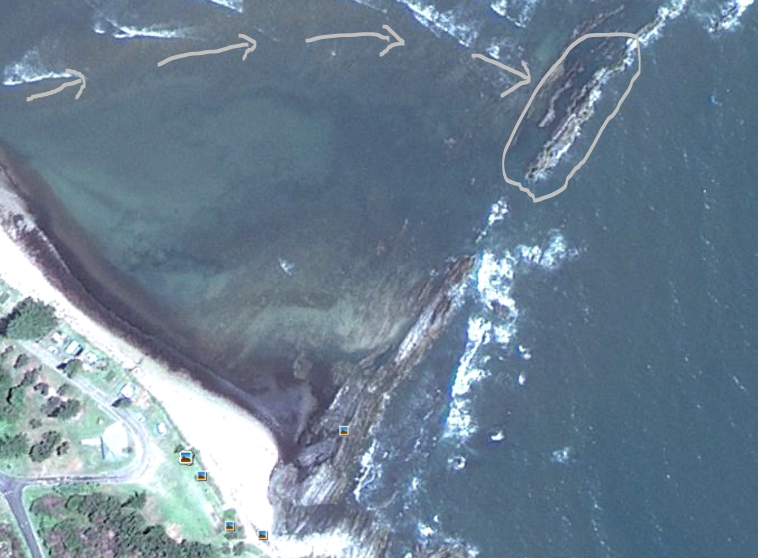 The bottom in this area is covered in rocks and kelp, with a few sandy holes in between. If you fish with heavy sinkers/ jigheads – you are doomed. 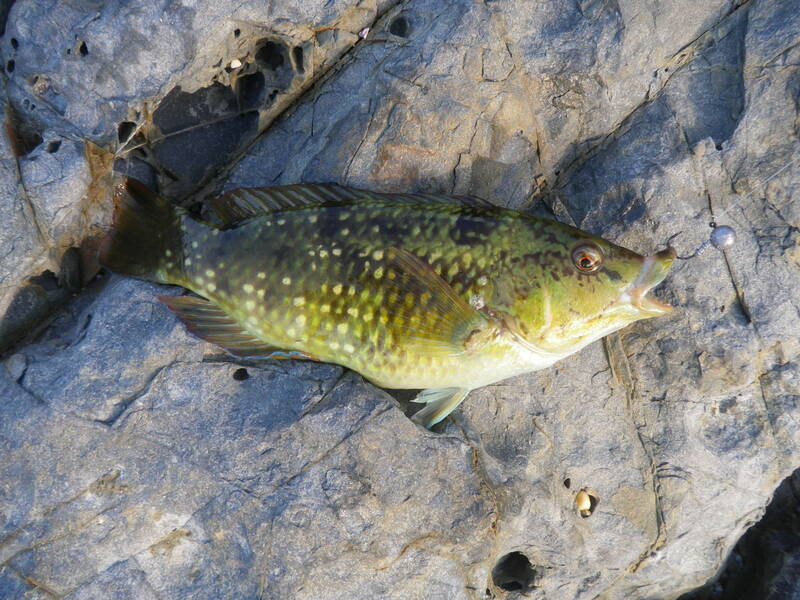 I pulled up a couple small speckled, green coloured fish that are common in amongst the rocks – not sure what they are – but they seem to like the soft plastics. Then I caught a strange red finned Wrasse of some kind. Then I found a few Pike – they always seem to hit the lure really close into the rocks, just as you are about to pull it clear of the water. Then I noticed a big shimmering area on the surface of the water about 50 metres away that was moving towards me – I waited for it to get in range and then cast the soft plastic straight into the middle of it. I got a couple of bumps but no hook ups. I cast out again and retrieved the lure quickly, so that it was swimming just below the surface. I could now see it was a good sized school of Bonito. I cast out again and this time I raced the lure back through the school and hooked up. I land a small Bonito and released it. For the next half an hour I had a great time catching and releasing Bonito, every time the school came in range. It was a decent size school and it circled the area for about 45 minutes before being chased further out by the Dolphins. And that was my last session at Brooms Head. The variety of fish had been fantastic, even if there had been no real trophy fish. 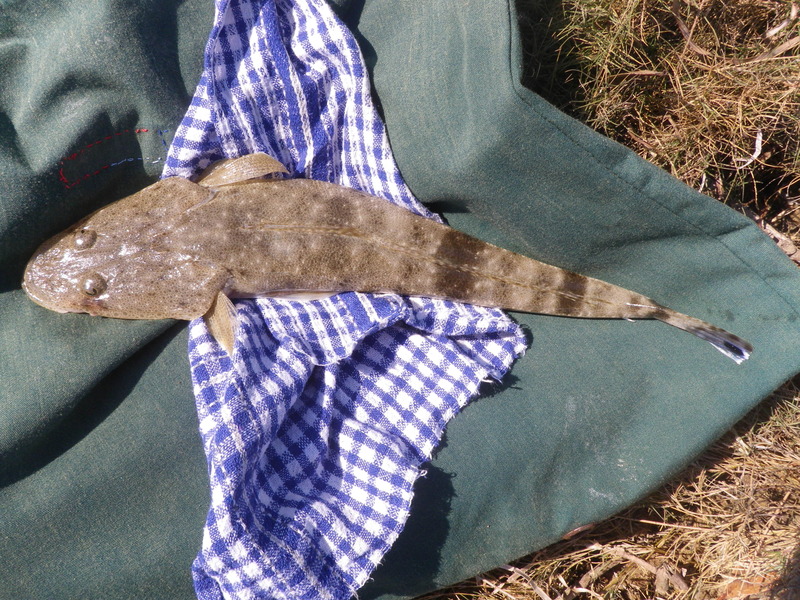 We had managed to catch dinner most days and I was quite happy with the diet of fresh Flathead and sea Bream. The weather gods had been very kind and I plan to be back again at the same time next year. Perfect conditions again, a big contrast to the wild weather of this time last year. I decided to take advantage of the calm waters and have a fish off the rocks at Red Cliff, a few km north of Brooms Head. As its name suggests, it is a large red cliff with a rock platform beneath. The platform offers some excellent fishing spots on the lower half of the tide. I arrived at about 9.15 am and the tide had been low at 8.50 am. The water was absolutely crystal clear and was able to hop from rock to rock until I reached an outcrop that looked over a couple of holes that were probably about 3 or 4 metres deep. With my polarized sunglasses I could clearly see the Bream sheltering at the base of the rocks in the calmer water. There was virtually now wind. I decided to cast out towards a spot where the waves were breaking over a rocky promontory. I was fishing with a 1/8th 1 jighead loaded with a GULP 2” Shrimp in the Pepper Prawn colour. This is always a good one to start with and I notice it’s a favorite with a lot of the ABT pros. Hungry Bream can’t resist it. As I hopped it along the sandy bottom towards the rocks, I felt a couple of bites and then a solid grab. 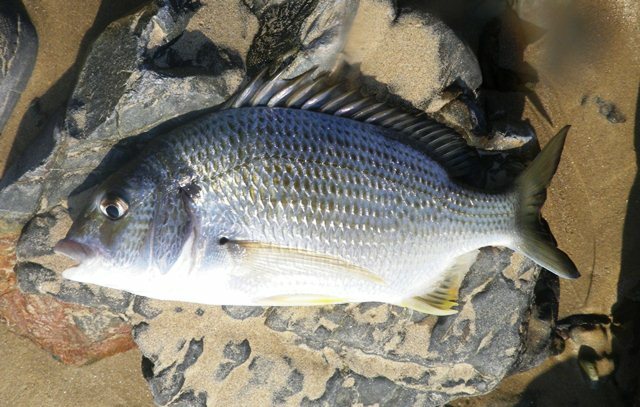 I landed a small Bream around 25cm, followed by a couple of slightly bigger ones and then a really solid, 34 cm fish. They had all come from the same spot and perhaps they wised up, because things then went quiet. I moved round to the other side of the rocks and cast in to some calmer water. I could see the lure float down to the bottom in between a couple of submerged bommies. As soon as I lifted it off the bottom, a small Bream darted out and grabbed it. I wound him in and cast out again, this time they didn’t wait and I was on to a better fish before the lure touched the sand. I landed it and decided to keep it – it was 33 cm long. As I wound it in, it had a couple of other Bream following. After a couple more casts I caught a smaller Bream and then this spot went quiet. I moved round onto another rocky outcrop and caught a couple more small Bream before calling it quits. It had been a good session and a great opportunity to clearly observe the way the Bream break cover to attack the soft plastic lures. I stopped fishing around 11.30 am. 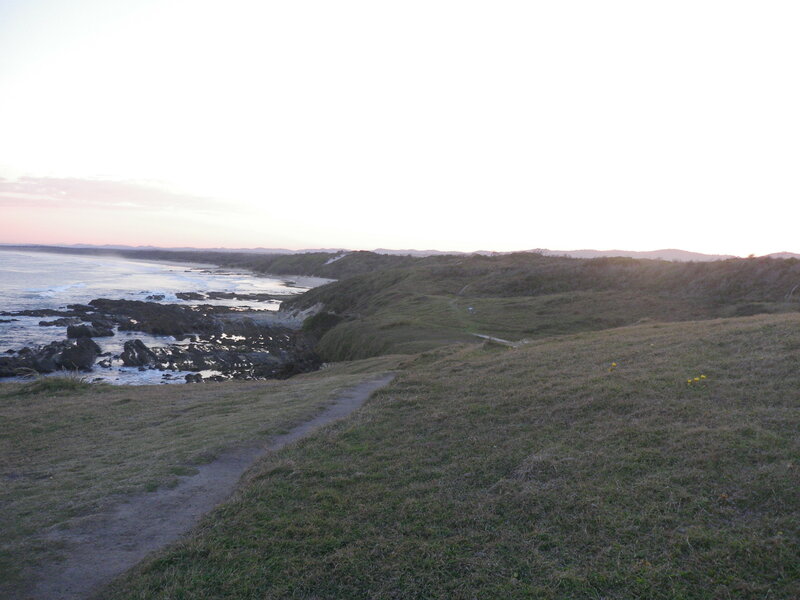 It was to be another land based fishing session at Brooms Head just south of Yamba, in Northern New South Wales. 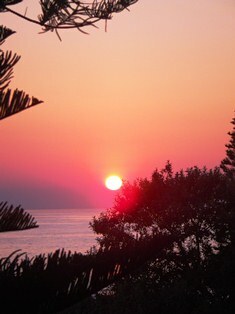 At dawn the wind was already gusting strongly from the south-east. 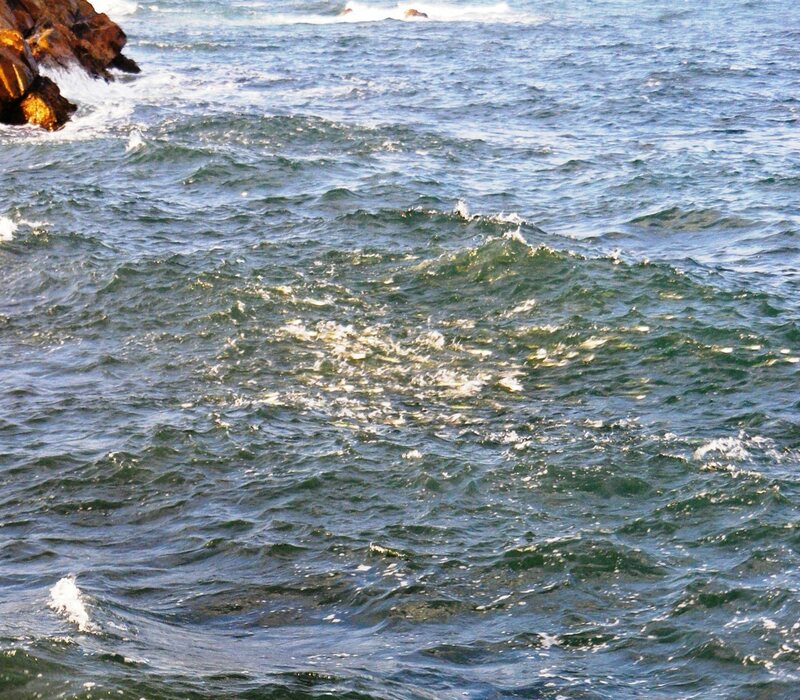 It was forecast to blow up to about thirty knots during the morning but the area on the west side of the lagoon was sheltered by the Brooms Head Bluff. I decided it was worth an early morning wade. Low tide was at 7.30 am and I was wading across the mouth of the lagoon, at the western end, at about 5.45 am. I had broken my lightest rod the day before so I was using my Nitro 7’6” distance spin rod and because of the breeze I had moved up to a heavier 1/8th oz, 1/0 hook jighead and 12lb fluorocarbon leader. I soon found the fish. They were lurking just on the border of the rocky northern wall of the lagoon, where the weed covered rocks met the sand. I started with a Pike and then 30cm Tarwhine and then three of the striped Trevally. I released them all and with nicely chilled nuts, I waded back for a hot shower and breakfast. I was up early on Tuesday and decided to try the other side of the Brooms Head lagoon. Low tide would be at 6.20 am and I set off just after first light, at about 5.30 am. 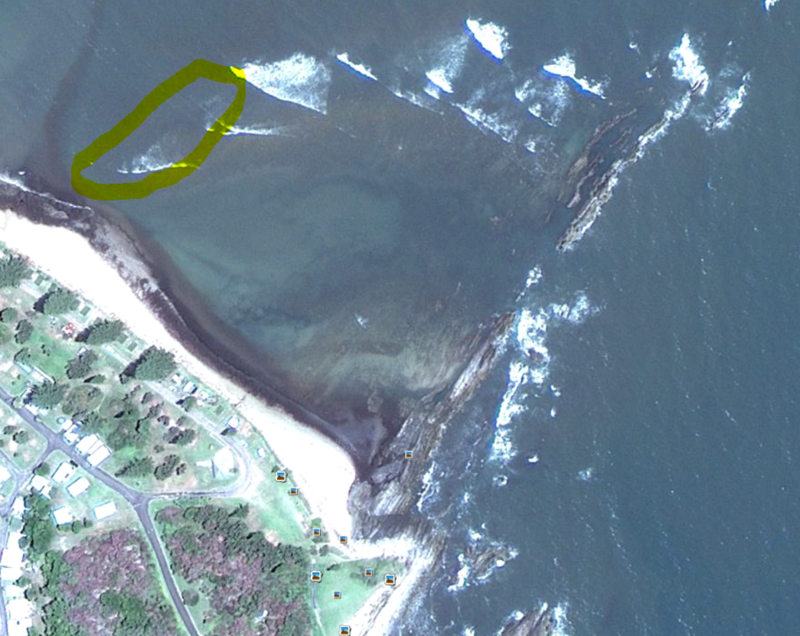 The wind was blowing at 15 knots, west south westerly, but the main bluff gives this area a bit of cover and so it felt like less. 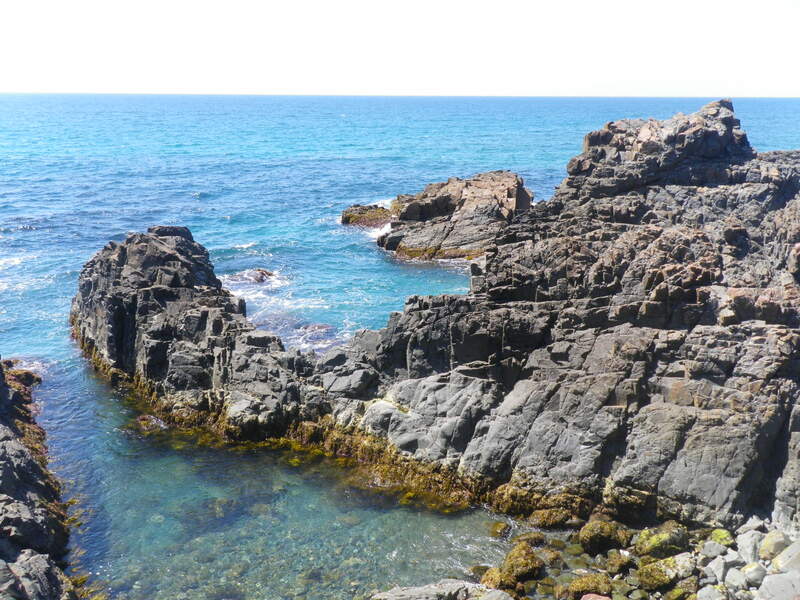 I waded out through the bottom of the tide and scrambled over the rocks on the northern edge of the lagoon until I reached the series of ridges that form the eastern wall. It gets a bit tricky here -there are deep pools between the ridges so you have to get over them. There are points where you can cross but you need good, non-slip rock boots to avoid ending up in the drink. Eventually I was facing east, on the front rock ridge and casting into very fishy looking water. I had the light set up again but had upgraded to 16lb leader as I was hoping for some bigger fish. I used the GULP 3” Pearl Watermelon Minnow soft plastic but rigged it on a 1/6th 1/0 jighead as there was now a bit of swell building up. A few casts produced a few small Pike and a very small Bream and then bang! Something came and grabbed the lure just as I was about to lift it from the water. I had the drag set reasonably tight because of the proximity of the rocks and the whippy Gary Howard Estuary 9’ bent over and line started peeling. The fish took a couple of metres of line then stopped. Then there was another violent surge as it took off again. The rod jerked bent over and I heard the sickening crunch as it snapped just below the join. I attempted to play the fish with the broken rod but it made short work of the leader and soon bit me off. This session was over. I trudged back for a shower and breakfast imagining an enormous Snapper. I needed more, but now the wind was howling so I considered the options and decided to drive down to the Sandon River, which is only about 10 kms away. The Sandon River is a small, pristine, shallow river system that holds plenty of Flathead, Bream, Whiting and Luderick. There are lots of points along its banks where you can fish – many, right next to the road. I stopped close to an informal boat launching area that is near an old oyster lease. The remains of the oyster beds have been covered by weed and form good fish holding structure. I stuck with the same soft plastic that had been working well and decided to rig it on a very light 1/16th oz, 1 hook, jighead. 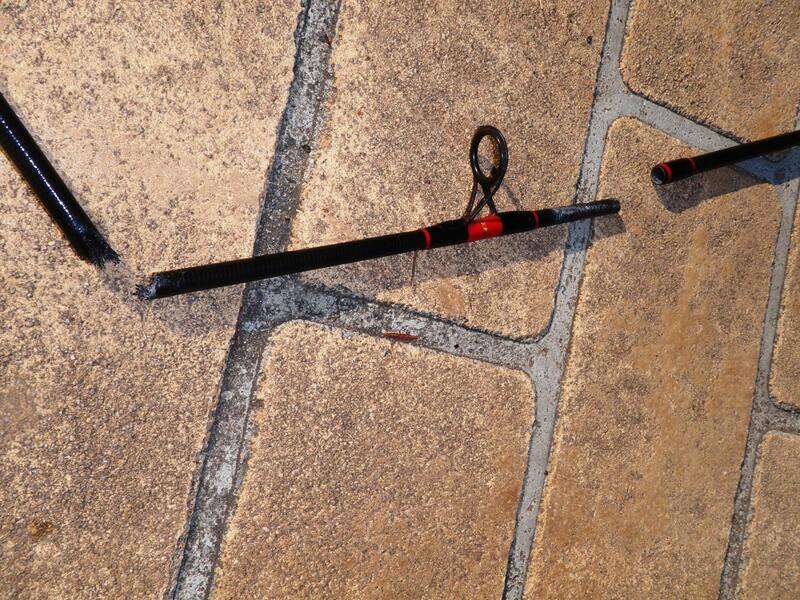 I dropped down to a 10lb fluorocarbon leader and I was now fishing with my Nitro 7’6” 2-4kg Distance Spin rod. The weather was good again. There was a light breeze from the south west. It was sunny and clear and the wind still had some chill in it. The last few sessions, fishing at Brooms Head in Northern New South Wales had suggested light tackle was probably the best option. I decided to fish the drain at the western side of the Brooms Head lagoon. The lagoon sits just north west of the main Bluff and is deepest by the rock ridge at its mouth, to the east. As the tide rises and falls, the water enters and exits close to the beach via a big sandy drain. The drain never fills to more than about waist deep. If you walk across it your reach rocky/ weedy covered bottom that forms the north wall of the lagoon. Further north, where this wall drops off to a sandy bottom is a great fish holding area. They sit here waiting for food to be washed in and out of the lagoon on the rising and falling tides. The area is highlighted in the aerial photo. I was using the Gary Howard 9’ Estuary rod again. I had loaded a very light 1/16th oz 1 hook jighead. I wanted to avoid getting snagged on the rocky weedy bottom. I used about 1.5 m of 10lb breaking strain fluorocarbon leader. 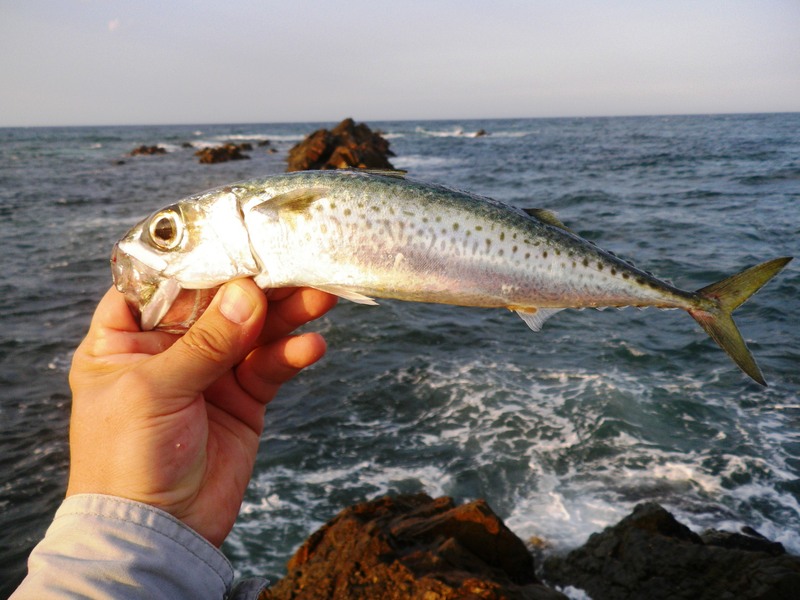 I used the soft plastic lure that had been successful the day before – the GULP 3” Minnow in the Pearl Watermelon colour. I waded out into the water, which was surprisingly warm. I put in long casts out over the rocks to the sandy areas to the north. Every time I lifted the lure over the edge of the rocks there would be a small bite or nudge from a fish. The tide was running in and had been low at about 5.30 am. 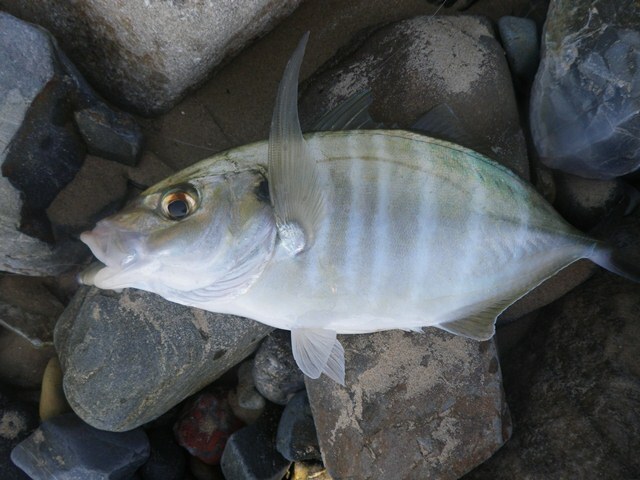 The incoming tide had also produced the fish the day before. After a bit of wading around up and down the rocky bottom I was onto a fish. It was a good Bream around 30 cm long. I cast back out in the same spot, and the plastic was slammed as soon as it hit the water. The fish pulled hard and took a bit of line. It felt much stronger than the Bream. It kept turning to run as I waded back into the beach, to land it. I saw the stripes in the water and realized it was a small Trevally. It really had pulled hard on the light rod. I released it and headed back out. It was about 8.30 am and the tide was running in strongly. Over the next hour I caught two more small Bream, a Tarwhine, three more Trevally and a couple of Pike. The cold southerly breeze eventually made me too cold to carry on but I was delighted to find a few fish. At around 9.45 am I went back to our cabin for a hot shower. Fishing with lighter gear had paid off. I have my 9 year old daughter with me this week so 4.30 am starts are out of the question. She likes to fish, but not that much! At around 8.00 am I persuaded her to walk from Brooms Head south, past the Brooms Head Bluff to Back Beach. It was already warm and fairly still with a very light northerly wind. Low tide had passed at about 5.00 am. After a disappointing session with the heavier fishing rod and reel the day before, I swapped down to my favorite light beach rod, a Gary Howard Estuary, 9ft. It is excellent for Whiting, Dart and Bream – very whippy with loads for spring and great at hooking fussy fish. It works best with a 1/8th or 1/6th jighead and although it is really designed for an Alvey, I use a Shimano Seido 2500 spinning reel. I have never really mastered the Alvey. I use 10lb Fireline or Braid and usually a 10 or 12lb fluorocarbon leader. As the fish had been reluctant to bite the day before and because we were outside ideal fish feeding hours (dawn and dusk) I decided to start with a 6lb leader. 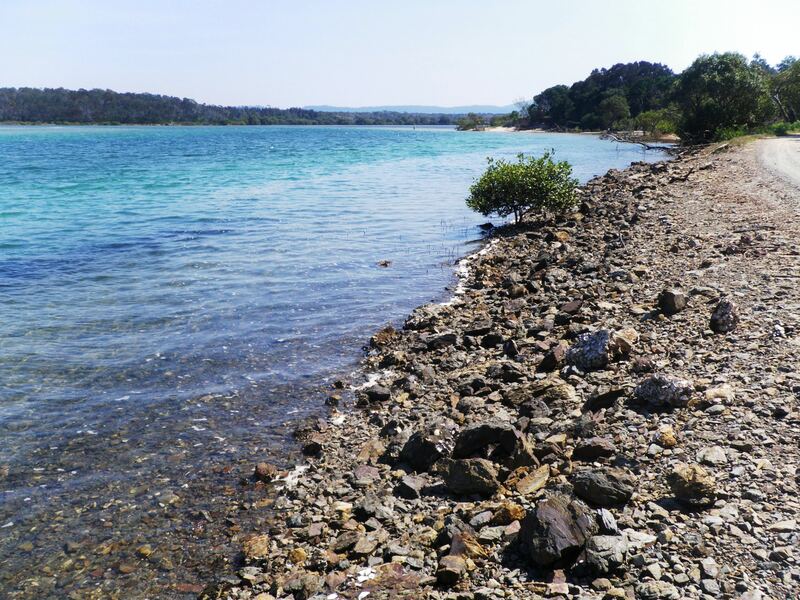 I waded out to about waist deep and cast in to the northern corner of the bay, just where the rocks meet the sand. I had loaded up with a 2” GULP Shrimp soft plastic in the Banana Prawn colour. I could feel the 1/8th 1 jighead bumping on the rocks and it soon got snagged. I swapped down to a 1/16th 1 hook jighead and put on a 3” GULP Pearl Watermelon Minnow soft plastic. It is not usually possible to cast such a light weight into the surf, but today conditions were calm enough to do it. After a little while I started to cast over the top of the rocks as the tide was moving up quite quickly. The jighead was now light enough to bump over the top rather than get snagged. 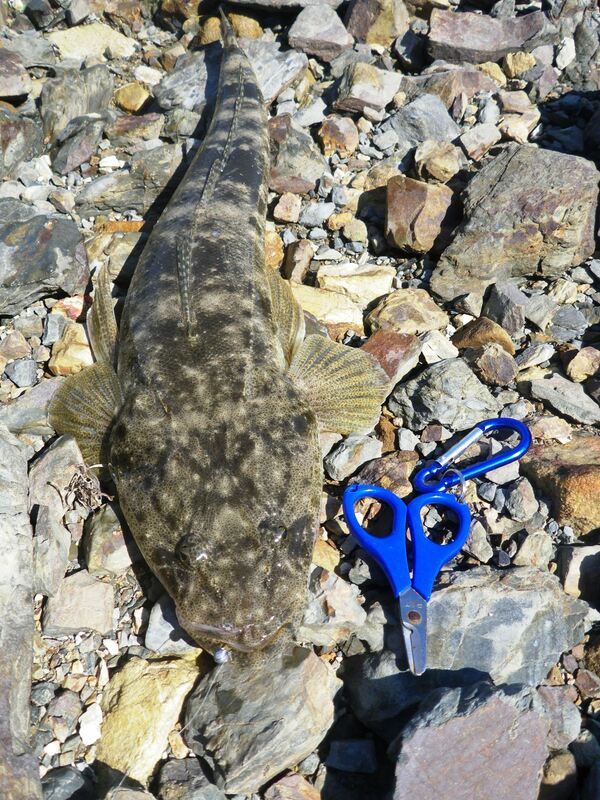 Just as the lure reached the edge of the rocks it was grabbed. The rod tip bent over and I had a fish on. It took some line but then swam into the rocks and made short work of the 6lb leader. I re-rigged with a 10lb leader and cast back out with the same weight jighead and soft plastic lure. After a few casts, I felt a couple of bumps and knocks and then bang, I had a fish. This time the leader held and I steered the fish back up the beach. 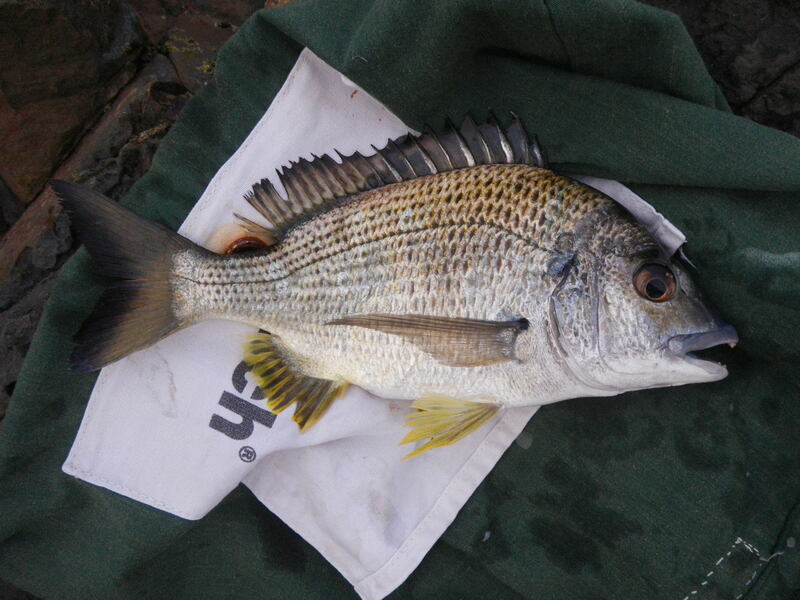 It was a Bream around 30 cm. I put it in the bag and carried on fishing. About ten minutes later the same thing happened, this time it was a Tarwhine, about the same size, but with much more fight in it. Now I had dinner so it was time to quit and go for a swim. Conditions were perfect and the water was crystal clear. 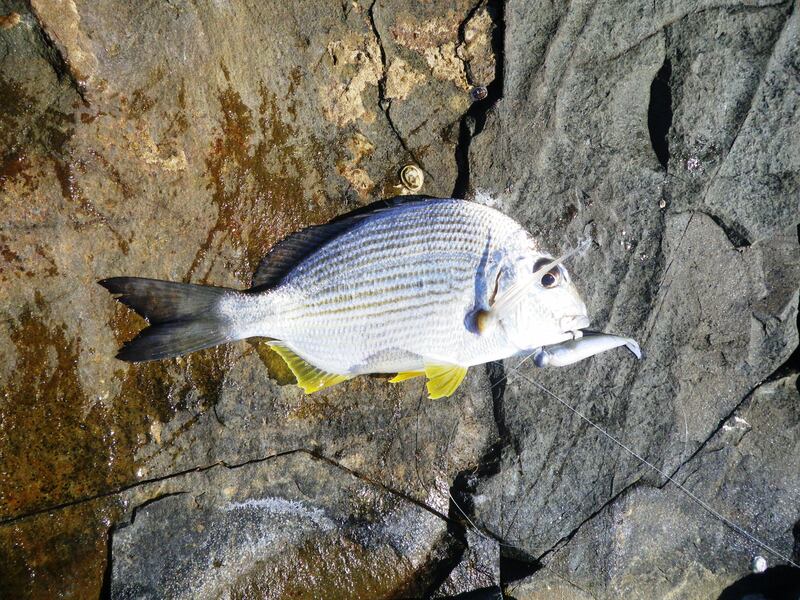 Even without a mask you could see plenty of Bream swimming around and good schools of bait fish in close to the shore. We arrived at Brooms Head at about 3.00pm on Saturday. I grabbed the rod and headed straight for the rocks, out the front. There was no wind and it was a hot, still afternoon. There was no swell and the tide would be low at about 5.00 pm. This meant it was quite safe to cross out onto the rocks in front of the main headland and fish over, into the deeper water beyond. I loaded up the 9’ Daiwa Demon Blood with a 3/8th oz 2/0 jighead and a 5” GULP Crazylegs Jerkshad in the Black Shad colour. I had high expectations – this area looks very fishy, but I have rarely been able to get close enough to it, to fish. The first cast got snagged and so did the second, so I switched to a ¼ oz jighead. I felt a few small hits and lost the tail on the soft plastic lure. I gradually changed down through the soft plastics to a 3” GULP Minnow, in the Pearl Watermelon which caught a couple of Butter Bream and eventually a just legal, Bream. Just before dark, I gave up, disappointed and with nothing for supper.